The narrative of the voyage that will ultimately take Paul to Jerusalem is now resumed in detail. 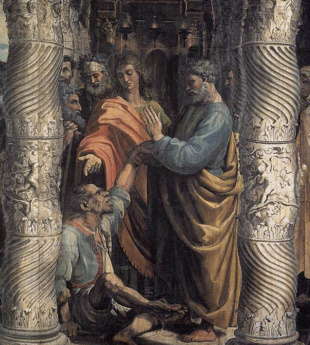 It is quite clear, from Luke's mode of expression, that the vessel sailed from Miletus on the day of Paul's discussion with the Ephesian elders (Acts 20:17 - 38). With a fair wind Paul's ship would easily run down to Cos in the course of the same afternoon. The distance is about forty nautical miles and the direction is due south. The phrase used implies a straight course and a fair wind, and we conclude, from the well-known phenomena of the Levant, that the wind was north-westerly, which is the prevalent direction in those seas. With this wind the vessel would make her passage from Miletus to Cos in six hours, passing the shores of Caria, with the high summits of Mount Latmus on the left, and with groups of small islands (among which Patmos, Revelation 1:9, would be seen at times) studding the sea on the right. Map of apostle's greatest success! Cos is an island about twenty-three miles in length, extending from south-west to north-east, and separated by a narrow channel from the mainland. But we should rather conceive the town to be referred to, which lay at the eastern extremity of the island. Cos is described by the ancients as a beautiful and well-built city. It was surrounded with fortifications erected by Alcibiades towards the close of the Peloponnesian war. Its symmetry had been injured by an earthquake, and the restoration had not yet been effected, but the productiveness of the island to which it belonged, and its position in the Levant, made the city a place of no little consequence. The wine and the textile fabrics of Cos were well known among the imports of Italy. Even now no harbor is more frequented by the merchant vessels of the Levant. The roadstead is sheltered by nature from all winds except the northeast, and the inner harbor was not then, as is is now, an unhealthy lagoon. Moreover, Claudius had recently bestowed peculiar privileges on the city. Another circumstance made it the resort of many strangers, and gave it additional renown. Cos was the seat of the medical school traditionally connected with Aesculapius; and the temple of the god of healing was crowded with votive models, so as to become in effect a museum of anatomy and pathology. The Christian physician Luke, who knew these coasts so well, could hardly be ignorant of the scientific and religious celebrity of Cos.
On leaving the anchorage of Cos, the vessel Paul was on would have to proceed through the channel which lies between the southern shore of the island and that tongue of the mainland which terminates in the Point of Cnidus. If the wind continued in the north-west, the vessel would be able to hold a straight course from Cos to Cape Crio, and after rounding the point she would run clear before the wind all the way to Rhodes. Another of Apostle Paul's voyages will lead us to make mention of Cnidus (Acts 27:7). We have supposed Apostle Paul's vessel to have rounded Cape Crio, to have left the western shore of Asia Minor, and to be proceeding along the southern shore. The current between Rhodes and the main runs strongly to the westward. The north-westerly wind, however, would soon carry the vessel through the space of fifty miles to the northern extremity of the island, where its famous and beautiful city was built. No view in the Levant is more celebrated than that from Rhodes towards the opposite shore of Asia Minor. The last ranges of Mount Taurus come down in magnificent forms to the sea; and a long line of snowy summits is seen along the Lycian coast, while the sea between is often an unruffled expanse of water under a blue and brilliant sky. Across this expanse, and towards a harbor near the farther edge of these Lycian mountains, Paul's course was now directed (Acts 21:1). The river Xanthus winds through a rich and magnificent valley, and past the ruins of an ancient city. The harbor of the city of Xanthus was situated a short distance from the left bank of the river. Patara was to Xanthus what the Piraeus was to Athens; and though this comparison might seem to convey the idea of an importance which never belonged to the Lycian seaport, yet ruins still remain to show that it was once a place of some magnitude and splendor. The bay into which the river Xanthus flowed is now a "desert of moving sand," which is blown by the westerly wind into ridges along the shore, and is gradually hiding the remains of the ancient city; but a triple archway and a vast theater have been described by travelers. In the war against Antiochus, this harbor was protected by a sudden storm from the Roman fleet, when Livius sailed from Rhodes. Now we find the Apostle Paul entering it with a fair wind, after a short sail from the same island. It seems that the vessel in which Apostle Paul had been hitherto sailing either finished its voyage at Patara, or was proceeding farther eastward along the southern coast of Asia Minor, and not to the ports of Phoenicia. Apostle Paul could not know in advance whether it would be "possible" for him to arrive in Palestine in time for Pentecost (Acts 20:16). An opportunity, however, presented itself unexpectedly at Patara. Providential circumstances conspired with his own convictions to forward his journey, notwithstanding the discouragement which the fears of others had thrown across his path. Paul and his companions, in the harbor of Patara, found a vessel which was on the point of crossing the open sea to Phoenicia (Acts 21:2). They went on board without a moment's delay. It seems evident from the mode of expression that they sailed the very day of their arrival. Since the voyage lay across the open sea, with no shoals or rocks to be dreaded, and since the north-westerly winds often blow steadily for several days in the Levant during spring, there could be no reason why the vessel should not weigh anchor in the evening, and sail through the night. We have now to think of Apostle Paul as no longer passing through narrow channels, or coasting along in the shadow of great mountains, but as sailing continuously through the midnight hours, with a prosperous breeze filling the canvass, and the waves curling and sounding round the bows of the vessel. A cheerfulness might be felt by the Apostle Paul and his companions, not without thankfulness to that God "who giveth songs in the night" (Job. 35:10), and who hearkeneth to those who fear Him, and speak often to one another, and think upon His name (Malachi 3:16). If we remember, too, that a month had now elapsed since the moon was shining on the snows of Haemus, and that the full moonlight would now be resting on the great sail of the ship, we are not without an expressive imagery, which we may allowably throw round the Apostle's progress over the waters between Patara and Tyre. 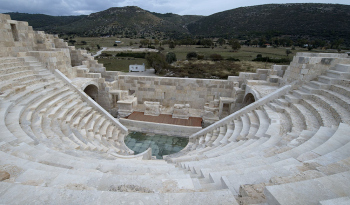 The distance between Patara and Tyre is three hundred and forty geographical miles. If we bear in mind that the north-westerly winds in April often blow like monsoons in the Levant, and that the rig of ancient sailing vessels was peculiarly favorable to a quick run before the wind, we come at once to the conclusion that the voyage might easily be accomplished in forty-eight hours. Everything in Luke's account of Paul's journey gives a strong impression that the weather was in the highest degree favorable; and there is one picturesque phrase employed by the narrator, which sets vividly before us some of the phenomena of a rapid voyage. After the second night, the first land in sight would be the high range of Lebanon in Syria (Acts 21:3). Paul and company would easily arrive at Tyre before the evening.